Your garage door experts – we’ve got you covered! Design Garage Doors was established in 2013 out of the desire to provide New Jersey, Connecticut, and Southern New York with state-of-the-art services related to the sales, installation, maintenance, repair and service of garage doors. Garaga, the industry leader in garage door manufacturing, is our main supplier, which guarantees reliability and safety. Whether you need a garage door for a new building or you want to replace an old garage door, our highly skilled team will help you decide on the most appropriate choice for your project. At Design Garage Doors, we promise 100% satisfaction to our customers. Please visit our image gallery to view our selection of overhead residential and commercial garage doors. Our wide variety of models and colors guarantees that you will find the perfect garage door for your project. Our highly trained personnel will answer any question you might have and will assist you in choosing the best garage door matching your needs and budget. Please contact us for a free estimate. Opening and closing the largest and heaviest door to your home should be done safely and in perfect security. This is why you need a reliable garage door opener, which will work flawlessly for the longest time. LiftMaster®, manufactured by Chamberlain, is the most reliable and efficient garage door opener. They are designed to withstand the harshest weather conditions and years of intensive use. Our personnel will help you choose the garage door opener that is suitable for the size and weight of your door. For additional information concerning the features and performance of our garage door openers, please take a few minutes to visit our door opener section. Call us today and we will be happy to help you find the right garage door opener for your project. A trustworthy, rapid service when you need it! Design Garage Doors is specialized in the installation, repair, service, and maintenance of all types of overhead garage doors, door openers, and accessories. We provide a wide range of services from professional garage door installation to repairing/replacing broken springs, broken/bent rollers, misaligned track, or replacement of broken or worn out garage door cables. Our highly trained technicians are always available to help if your garage door or door opener does not function properly, or needs maintenance! We provide emergency garage door services 24\7. 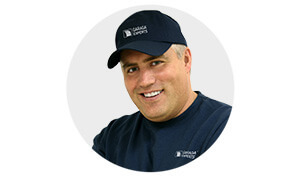 Design Garage Doors carries a large inventory of replacement parts ensuring prompt and timely service. Please call us to schedule a repair or an inspection. You may consider signing up for one of our preventive maintenance programs that will keep your garage door working reliably and safely. Design Garage Doors is located in Tenafly, New Jersey and we provide services in Connecticut, New York(Westchester County, Rockland County, New York City, Long Island, and Nassau County) and New Jersey (Bergen, Hudson, Essex, Mercer and Passaic).